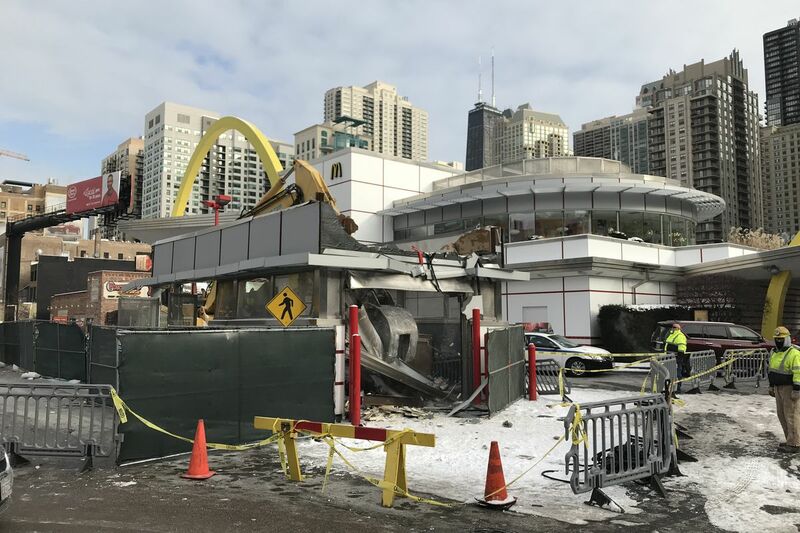 The Rock ‘n’ Roll McDonald’s days as a kitschy staple of River North are officially over. 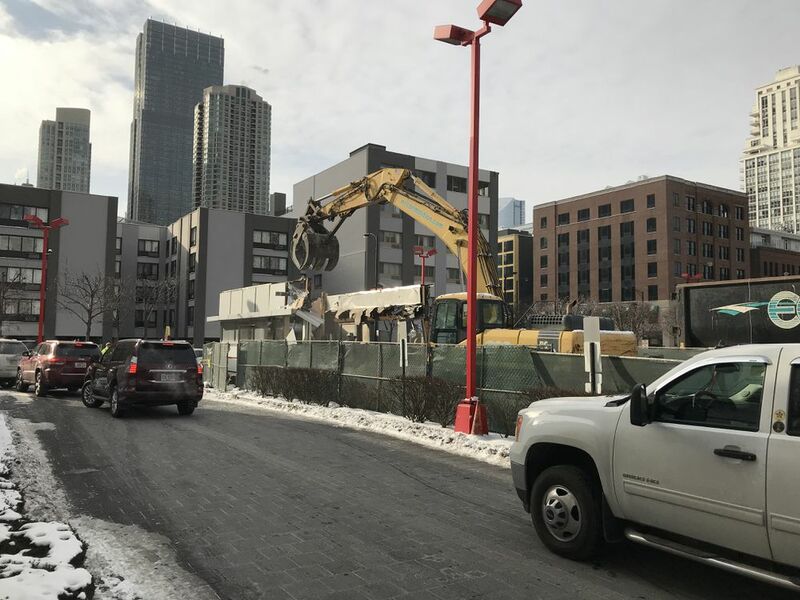 Wrecking crews began dismantling part of the property Thursday morning, just one day after a demolition permit was issued for the iconic fast food restaurant at 600 N. Clark Street. Earlier in December, McDonald’s announced it would be closing up the famous downtown franchise while it planned a more modern remodel. That rehab, however, seems to include more than just ditching the dated decor and adding table service. The permit calls for crews to wreck and remove the two-story restaurant as well as an adjacent pavilion that was once full of memorabilia left over from the “original” Rock ‘n’ Roll—demolished in 2004. The first floor and basement of the larger building will remain intact under the plan. 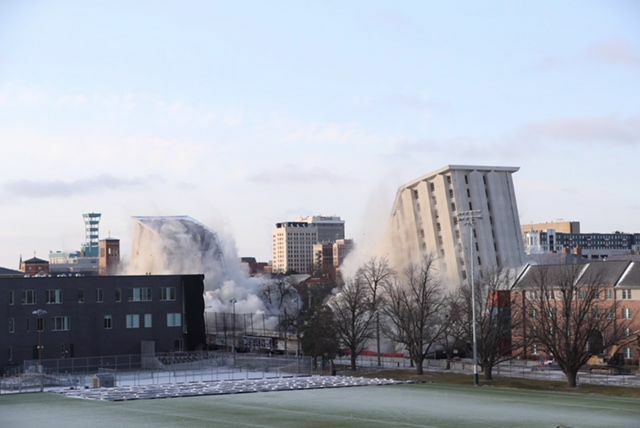 LINCOLN — Close to 10 blasts burst through the cold morning air Friday and two old University of Nebraska-Lincoln residence halls crumbled seemingly in slow motion as dirt and smoke rose. Some 1,000 spectators in and near a parking garage four blocks away murmured in surprise at the sight, then cheered as though at a rock concert. And that was the end of Cather and Pound Halls, 54-year-old high-rise dorms at UNL. Residence hall life is an important time for many, much like summer camp or a person’s first crush. 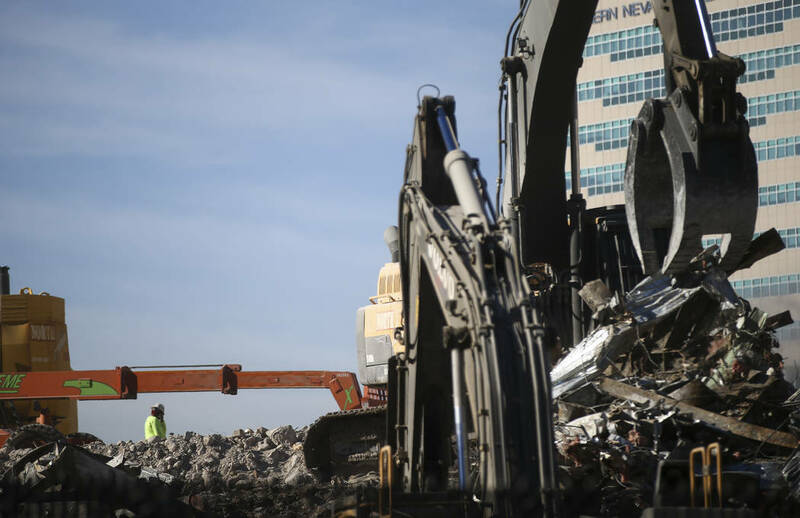 Cather and Pound now are rubble along 17th Street, but the memories created there will live on a long time. UNL officials said a quick review of the area revealed only two broken windows in two nearby buildings. So “from everything we know, all went as planned,” said Sue Gildersleeve, director of UNL housing. UNL official Grant Watson noted another consequence. “We do have some very disoriented squirrels running around,” he said. UNL freshman Kailey Claussen of Omaha was among the hundreds on the top floor of the parking garage northeast of the implosion. Claussen remembered the recent failed implosion of the Pontiac Silverdome in Michigan and didn’t want her university to experience a similar embarrassment. “I was glad they fell,” she said of Cather and Pound. Tom McManus, a Lincolnite and UNL employee who had worked on the project, said he wasn’t disappointed. “I thought that was incredible,” McManus said of the implosion. Gildersleeve never lived in those dorms, but she had still become attached to the university’s oldest high-rise residence hall complex. There were so many friendships formed there, she said, and married couples who met there. “It made me cry,” she said. Most who lived there had a slew of memories. Beth Llewellyn McLaughlin, now of Fort Worth, Texas, recalled winning a couple of intramural softball titles while living in Pound in the mid-1970s. Joe Kottas, who lives in Lincoln, remembered card games with his buddies in Cather in the 1970s. Kottas watched a livestream of the implosion on his computer Friday morning in his office. “Before the event, I thought I might get a little emotional, but it came down, and I was fine,” Kottas said. Ken Zaroban of Nebraska City awaited the implosion on the fifth floor of the parking garage and recalled how guys used to play golf with two-by-fours and tennis balls down the hallways of Cather in the early 1980s. The sun came out. The top of the parking garage was slick with ice. Some observers wrapped themselves in blankets. Some carried coffee, some had cameras. A horn honked twice to signal that the implosion was coming. It honked twice again and a newsman said, “It’ll be about 45 seconds … ” Boom! Boom! Boom! At a press conference, Gildersleeve said Cather and Pound would have been too expensive to renovate. Information from this article was first published in Demolition Magazine and is being reused with permission from the National Demolition Association. On Sunday, April 2, 2017, the Empire Group received an emergency call. The Reading Fire Department needed help fighting a three-alarm blaze in a vacant four-story warehouse at 11th and Chestnut streets in Reading, PA.
“I got the call around 11:30 a.m.,” says Todd Quinter, operations manager for Empire Services. This was not the first time the demolition expert and 33-year employee of Empire had received such a call. 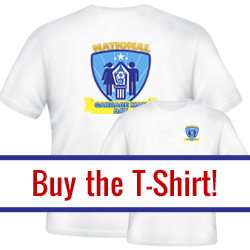 Since its founding by Harry “Whitey” O’Neill Jr. in 1955, National Demolition Association (NDA) member company Empire Wrecking Co. has provided demolition services to the city of Reading and surrounding areas in Eastern Pennsylvania. Quinter says Empire has assisted Reading firefighters many times, in addition to working on numerous non-fire-related jobs for the city. Over the years, the company grew and expanded to meet the needs of customers. 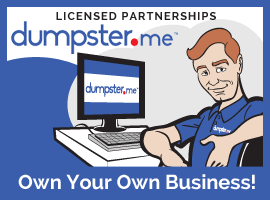 Five new companies were founded to offer building products, transportation, environmental remediation, waste disposal and utility repairs. The founder’s sons, Harry J. O’Neill III, president, and Todd M. O’Neill, executive vice president, lead the Empire Group, which today includes six subsidiary companies, powered by more than 200 employees and more than 400 pieces of equipment. After the fire, the city wanted the old warehouse torn down. Empire won the job and ended up removing 6,700 tons of waste from the project.On this day, as on so many others, Empire Services quickly heeded the city’s call for help. The fire was burning near the center of the large warehouse, which formerly housed Letisse Handbags and L&B Metals. Empire used a Hitachi 300 65-foot long reach excavator to assist the Reading Fire Department gain access to the fire. The Empire crew worked into the evening helping Reading firefighters extinguish the blaze. The cause of the fire is still unknown and under investigation. Luckily, no injuries were reported. In the days that followed the fire, Empire received another call for help, this time from Reading city officials. Due to the instability of the burned building, the city wanted to demolish the entire structure. Reading awarded Empire the contract for the demolition. This good rapport found an Empire crew again working into the evening, this time placing temporary fencing around the site on 11th and Wunder streets. The fencing was installed to close the road and ensure the safety of the many residents in the densely populated neighborhood. The warehouse was four stories in some areas and two stories in others, all of it interconnected. The building was mainly brick, and the debris was brick, cement and wood. When the businesses left the building, they left everything inside, adding to the debris that needed to be removed. “As we tore the building down, we moved tons of debris out,” Quinter says. Delaware Valley Contractors, another Empire Group company, provided transportation, including tractors with lowboy trailers to deliver equipment. They also supplied large walking floor trailers and tri-axle dump trucks to remove the 6,700 tons of debris, primarily brick, cement and wood. “We sometimes used three walking floors in a day to take away debris, with those three trucks making multiple trips each day,” Quinter says. In addition to the vacant warehouse, the city also requested that Empire demolish a vacant row home connected to the warehouse, located at 235 S. 11th St. This row home was one of two major challenges Empire encountered on the project. It was connected to another row home that was to remain intact, and people were living in that house. “We moved very gingerly in that area,” Quinter says. The row home’s roof was unstable, so Empire used a JLG 45-foot high reach to allow workers to separate the roof by hand in the spot where the warehouse and the row home were connected. A machine was used to take the rest of the roof off the house. The other challenging aspect was a 12-foot-wide alley between the warehouse and the row home that would remain. The house was located on Wunder Street. City officials had required the people to move out of that house temporarily because the warehouse was structurally unsafe. Empire put shoring up along the wall that was toward the house as an extra precautionary measure. Empire crews worked at the site throughout April and May, and were cleaning up the last details in June. The majority of the demolition took place during April. 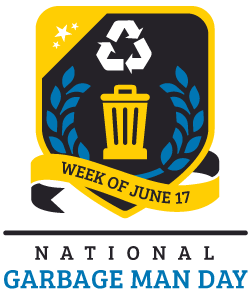 In addition to keeping everybody safe and staying on schedule, Dejewski reports that almost 50% of the building waste was recycled. It was crushed and designated for reuse on other projects as needed. The demolition project also produced an unplanned aesthetic victory. For decades, the residents of the neighborhood had looked out on a major eyesore: the abandoned four-story warehouse. After a few weeks of demolition, a welcome new view greeted neighbors for the first time. The removal of the tall brick walls revealed one of the most iconic and loved buildings in Berks County, the Pagoda, as well as the lush forests of Mount Penn. Built in 1908, the Pagoda sits atop Mount Penn and has been a tourist attraction and a symbol of the city of Reading for more than a century. The unique wooden structure was inspired by Japanese pagodas and features seven tapering stories. In 1972, it was placed on the National Register of Historic Places. Residents in the neighborhood often sat on their porches and watched the demolition take place. When asked their opinion on the changes, many said they were happy to say goodbye to the vacant warehouse. They expressed hope that the new vacant lot will become a recreational park or additional space for parking. Empire Group assists the city of Reading, PA, in extinguishing a blaze and removing an eyesore in a densely populated neighborhood! An entire city block is being demolished to make way for a new resort. No definitive plans for the new resort have been announced. 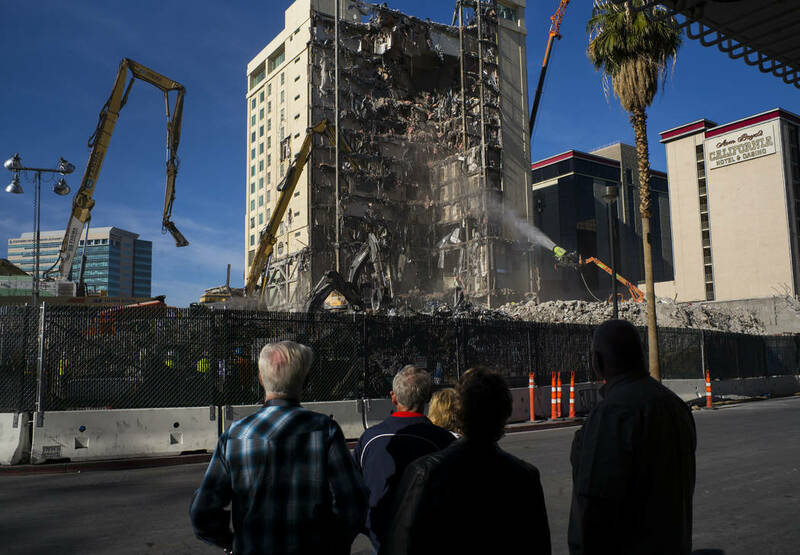 In an interview earlier this year, Derek Stevens said it is virtually assured there will be more rooms when the project is completed than there were when the Las Vegas Club closed. The historic downtown property opened in 1930, a year before casino gambling was first legalized in Nevada. When it closed for good on Aug. 20, 2015, the Las Vegas Club had 410 rooms. 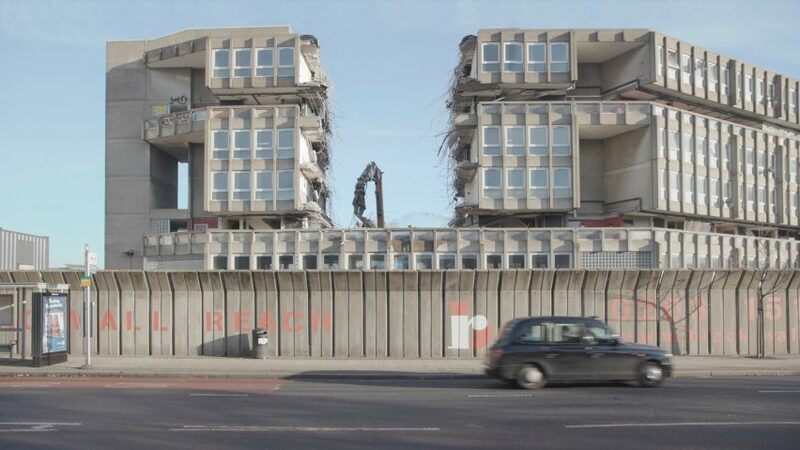 Destruction of the seminal 1970s estate in east London, designed by architects Alison and Peter Smithson, first began in August 2017. But the two concrete slab blocks that make up the complex have remained largely intact until now. Dezeen’s video footage reveals that demolition machines started pulling apart the western block earlier this week. The film shows a claw-like machine tearing down an entire section of the seven-storey building. The machine can be seen pulling through the building’s “streets in the sky” – the network of outdoor walkways connecting every home, and one of the key elements of the Smithsons’ celebrated design. It can also be seen knocking out windows and tearing through floors. Robin Hood Gardens was completed in 1972. Located in Poplar, near the Blackwall Tunnel, the estate comprised two long, crooked slab blocks arranged around a large garden with a grassy mound. The demolition of the estate has been in the works for nearly a decade. Back in 2008, when the buildings were first revealed to be at risk, hundreds of architects – including Zaha Hadid, Toyo Ito, Richard Rogers and Robert Venturi – campaigned to grant them a heritage-listing. Led by heritage body the Twentieth Century Society and supported by architecture magazine BD, campaigners argued that the historic structures were one of the UK’s most important examples of brutalist architecture. However, the campaign was unsuccessful and Robin Hood Gardens was granted immunity from listing, paving the way for the site to be redeveloped. Developer Swan Housing, supported by Tower Hamlets Council, plans to replace the estate with a larger housing scheme – providing 1,575 homes, instead of the 213 of Robin Hood Gardens. The new buildings are designed by London studios Haworth Tompkins and Metropolitan Workshop, and Scandinavian firm CF Møller. Speaking to Dezeen shortly before the demolition began, Simon Smithson – Alison and Peter Smithson’s son – described the destruction of Robin Hood Gardens as an “act of vandalism”. He also accused politicians of tampering with the heritage-listing system, to ensure the estate was destroyed. Similarly, the Twentieth Century Society recently added the estate to its growing list of lost architectural treasures, and hit out at the UK’s planning system for failing to protect the country’s architectural heritage. 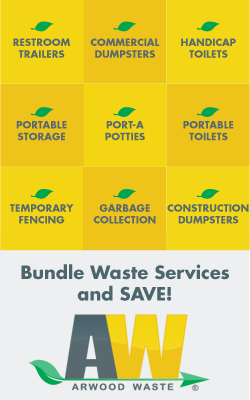 Prestige Carting is Long Island's #1 dumpster rental, junk removal, demolition & carting company. The owner of a Xenia shopping center is suing the city, claiming it erred in redeveloping a downtown property. The lawsuit filed in U.S. District Court by the owner of the Xenia Towne Square Shopping Center said the city erred in demolishing the Kmart near the Fulmer building, causing damage to the former grocery store. “Because the Kmart and Fulmer’s building adjoined one another, the city knew that demolition of the Kmart’s wall and roof tied to the Fulmer’s building required special care and skill in order to prevent damaging the Fulmer’s Building,” according to the lawsuit filed Wednesday by Blue Rock Investments LLC and the Boymel Family LLC. “However, when the Kmart was demolished in or around January 2017, the city and/or its agents failed to perform the demolition in a workmanlike manner such that the city’s demolition undermined the Fulmer’s building’s foundation and left holes in the Fulmer’s Building’s exterior wall,” the suit states. “To my knowledge, the city law department has not reviewed it in its entirety but when it does will respond accordingly via the proper legal channels,” Warren said. Commercial buildings are made to last, which is why they are so tricky to break down when they are no longer safe to continue standing. Whether your property has condemned buildings built a lifetime ago, are hurricane damaged, or any other commercial demo need, our team is here for you. In our experience, most commercial buildings are different from one another. Different builders prefer various materials, and depending on the age of the building, you may have asbestos, mold, and other harmful substances to consider. Between proper building codes, policies, laws, and EPA policies, you need a company that you can depend on for responsible demolition services. Unlike controlled explosive demolition services, the team behind Jacksonville FL Demolition is fast and affordable. Instead of using explosive tools, we rely on operator-driven machinery and professional demolition tools. It may not look near as fun, but it is safe and effective. If you need to remove a commercial structure but you’re afraid of any liability issues, you need the experienced team to help you. We’ve been eliminating commercial and residential structures for quite some time now, and we are still locally owned and operated. And other commercial structure removal needs. 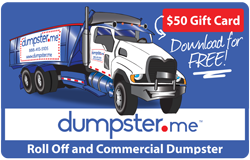 We offer more forms of commercial building removal than anyone else in Jacksonville Florida. By providing total partial and complete demolition for more structure types, we are the reliable choice for your job. Commercial spaces are at a higher risk for coming under fire from work safety regulations, environmental regulations, and even city code inspectors. If you are not careful about who you use for your structure removal services, you could be facing steep fines and other consequences. Our trained technicians can use every piece of equipment and machinery that we employ, and they have the experience to handle any sized project that you may have. By hiring local experienced demolition experts, we can make short work of even the most prominent building! If you have a commercial structure to remove immediately, call the demolition team you can trust today!